You can populate widgets with RSS feed from your or other websites, or videos from YouTube channels. We will not sell your widget space! You can also add custom "Media releases" with desired amount of clicks and target them to specific widgets on any of your websites. Visitors do not perceive widgets as advertisement, that's why widgets can have very high CTR and are an ideal cross-promotion tool! Place widget below the article/product so that your visitor can open additional pages. If they decide to leave, show them a Pop UP widget before they close tab. Use automatic Chrome PUSH notifications to notify them to visit your website again. Drive traffic as you desire by choosing where to show your widget and how to populate it. Promote your new website by showing its content on your already popular website. With HIGH CTR of Aklamator Widgets you can easily generate and sell clicks to your advertiser. Offer them new digital PR services that will have an impact. You can adjust widget size and dimensions anytime in dashboard so it can fit to your website perfectly (paste code only once, change widget easily from dashboard). Widgets are autopopulated from your website feed, but you can add custom ads/media releases. When visitor tries to leave your website, you can decide to show them a PopUP widget with special offers or latest content. PopUp widgets have CTR 10%+! Customize design, add campaign photo, buttons, classic widget or custom HTML code. Choose when, where and to whom do you want to show widget! Use them to retain or attract visitors! Ideal for promoting your YouTube channel promotion or playing latest video campaign! Add custom branding, choose intro YouTube video, and playlist or channel to be played. Video Float widget is unobtrusive, user can always minimize it, and sound will not be automatically played. Chrome supports the new emerging web standard for push notifications on Android and desktop, enabling users to opt in to allow a specific website to send them push notifications just like an installed native app. Just paste chrome subscription code, and Aklamator will enable you to automatically send notifications with latest website content. Aklamator will automatically send push notifications to all you chrome visitors showing them latest news. 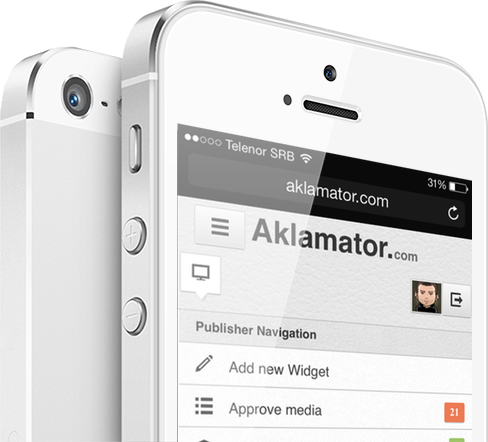 Aklamator will generate widget (that you can show on your’s or partners website) with product photo, title, regular price, discounted price, and average user score. Each link is tagged with UTM parameters so you can check how much sales/money aklamator earned for you! Make your own content platform. Offer additional content to your visitors, or exchange traffic with different websites from your own network. Boost income with paid content. FREE for up to 500.000 views/month! Create your FREE account and choose content source (RSS feed, YouTube) and widget dimensions & type. OR just install WordPress plugin. Copy&paste the widget code and place it on your website. In Aklamator dashboard you can change dimensions and look of the widget without changing code! OR simply drag'n'drop with our WordPress plugin. Analyze multiple widgets, number of views, clicks and CTR per widget. Take control over your traffic and easily manage multiple websites. Offer new digital PR service to your clients and profit using our service. We promise, we won't send you any spam. Just love. Create new title, choose photo and desired number of visitors to your website. We'll do the rest.